Ice crystals also have small beginnings - even smaller than previously believed. Already 475 water molecules can form a real crystalline structure; initial attempts can be discerned with 275 molecules upwards, as a cooperation of scientists from Göttingen and Prague has discovered. It was previously thought that around 1000 molecules were the minimum necessary for a complete crystal. The new lower limit for ice crystals was determined by researchers working with Thomas Zeuch from the University of Göttingen in an experiment developed by Udo Buck from the Göttingen-based Max Planck Institute for Dynamics and Self-Organization. 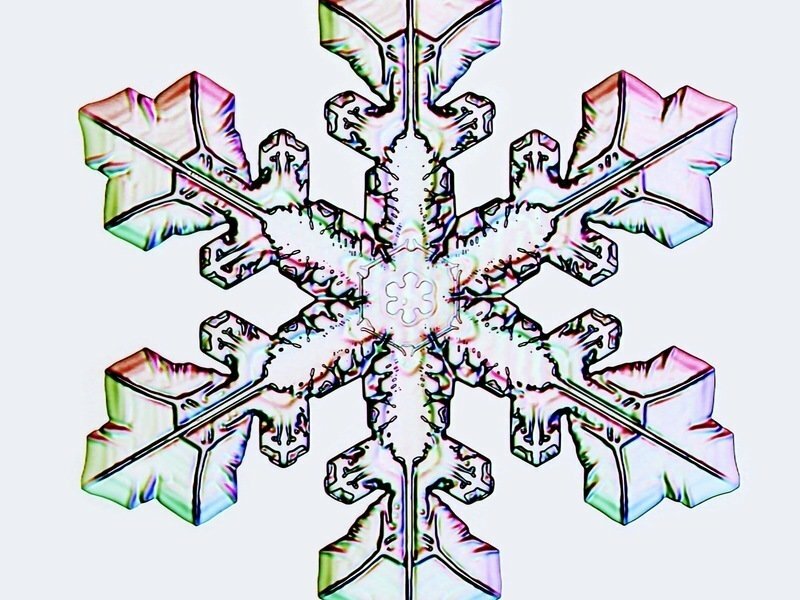 At the origin of the perfect crystal: water crystallises with a six-fold symmetry that can be seen in every snowflake. This structure already forms in water clusters with 475 molecules, which do not resemble a snowflake at all. Nothing is as natural for us as the behaviour of water. This includes what we might have experienced in summer - a long forgotten water bottle in the freezer compartment shatters. “However, this is actually very unusual.” Udo Buck still becomes enthusiastic about this after a long career as a scientist: “Strangely enough, water is one of the few substances known to us which occupies a larger volume in the solid state than in the liquid one.” The Research Group Leader at the Max Planck Institute for Dynamics and Self-Organization in Göttingen has achieved a ground-breaking result with the smallest water ice crystal. His co-authors, including Thomas Zeuch’s group at the Institute for Physical Chemistry at the University of Göttingen, and a researcher from the Technical University in Prague, have further improved an experiment that Buck has been developing since the early 2000s. The team has now solved a previously unsolved scientific mystery, namely the question of the minimum number of water molecules which must come together in order for them to be able to form a real ice crystal. “It all starts with 275 water molecules,” is Buck’s astonishingly precise answer, “and the crystal is completely formed when it has 475 molecules.” This is quite unexpected, Buck adds, because to date science has assumed a minimum cluster size of around 1000 water molecules. Physicists and physical chemists call conglomerates of a few, still-countable molecules clusters. The properties of these nanostructures are between those of individual molecules and the world of large solid bodies which can be handled and which consist of many billions of molecules. The cooperation in Göttingen does not, however, investigate the formation of ice from liquid water. Their discovery provides insights into processes whereby water vapour condenses directly to tiny ice crystals at low temperatures. “These processes play an important role in the upper layers of the atmosphere,” emphasises Buck, “and also in our planetary system.” The new finding could also assist climate research to improve its models of the atmosphere. So what did the researchers find out exactly? In ice crystals, the water molecules arrange themselves in a six-sided, or hexagonal, to use the scientific term, spatial lattice. Each water molecule forms chemical bonds, so-called hydrogen bonds, to four adjacent molecules. This honeycomb crystal lattice of water ice requires more space than liquid water, which is unusual. As long as the water clusters have not reached the minimum size for a crystal, the Göttingen experiment presents them with a dilemma. The experiments take place at around minus 180 to minus 150 degrees Celsius - the molecules are therefore much too cold for a liquid. For a crystal, however, they are still too few in number. The tiny clusters escape this quandary by forming a type of liquid that has clotted in the cold: they form a rather disordered, “amorphous” spatial lattice. With increasing size, very cold clusters of water molecules arrange themselves as a real ice crystal. 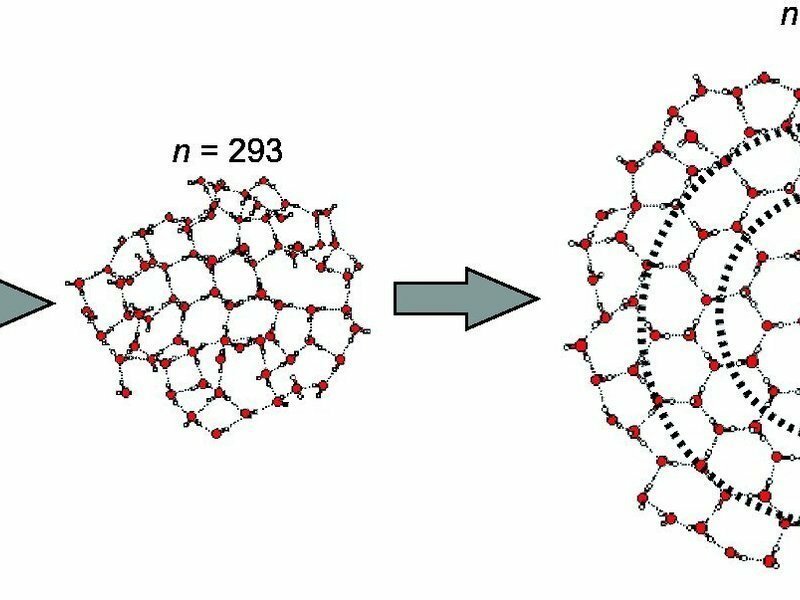 When there are 123 water molecules (left) clusters are still completely unstructured - like a rigid liquid. When there are just under 300 molecules (centre), the hexagonal structure of the ice crystal is already discernible in the cluster’s core. When there are 600 molecules (right), the interior of the ice crystal is already perfectly formed, only the outer layer is still unstructured (“amorphous”). If the cluster now grows, the water molecules at its core can change at some stage from the disordered chemical game into the crystalline structure by each of them taking four neighbours by the chemical hand. 275 water molecules thus create the initial beginnings of a real ice crystal with hexagonal structure in the interior of the cluster. To begin with, this structure is still slightly deformed; however, as the cluster grows in size, this interior grows to become a nicely ordered ice crystal, while the outer layers remain amorphous. “When there are 475 molecules, the very core is already perfect,” says Buck. The scientists could only obtain this insight into the formation of ice crystals with the aid of a complex experiment. Normally, scientists scan crystals with X-rays, which are diffracted by the lattices. This produces characteristic patterns of the radiation, which provide information on the lattices’ structure. The problem was that these signals were too weak for the accurate investigation of the small water clusters, explains Thomas Zeuch. The vibration between the oxygen atom and the hydrogen atom of a molecule provides a much stronger signal, in contrast. The frequency of this molecular vibration is in the infrared, i.e. light of long wavelength, and the apparatus measures the effect of this radiation. Crucial here is that the infrared signal shifts significantly due to the formation of hydrogen bonds between the hydrogen atom of one molecule and the oxygen atom of another as soon as the hexagonal crystal lattice forms. This is the fingerprint of real water ice, which the researchers were able to detect for the first time in clusters of a few hundred water molecules. This so-called infrared spectroscopy of such small clusters works only with a few tricks, however. The experiment initially produces individual, cold clusters. The clusters then fly at more than the speed of sound through a chamber in which each collects one individual sodium atom. They then fly on for around 240 microseconds (millionths of a second) to the actual measurement. The attached sodium atom is extremely crucial for this, explains Thomas Zeuch, as it allows the clusters of the desired size, i.e. the 275 water molecules, for example, to be gently ionised, sorted with an electric field and measured specifically. The sodium atom in the water cluster also has a second, quite complex function. “It acts as a type of photographic paper,” says Zeuch, in order to illustrate its role. “We initially irradiate the clusters containing the sodium atom with the infrared light,” says the physical chemist. “Then we ‘develop’ it with a laser pulse of ultraviolet light.” The sodium atom does not, of course, provide a spatial photo with this combination of laser light of different frequencies: instead, it provides an infrared spectrum of the tiny water cluster. This decisive trick was the breakthrough. Udo Buck developed the fundamental principle of the experiment at the Max Planck Institute for Dynamics and Self-Organization. Today, the apparatus is with Thomas Zeuch at the University of Göttingen. The scientists in this group had theoretical support from Prague as they continued to develop it until it became possible to investigate clusters comprising several hundred water molecules. The researchers now want to experimentally investigate the crystallisation of further substances and their surface properties as well - accurate to one molecule, where possible. Another reason why Zeuch is so enthusiastic about the new experimental procedure is that it can be applied not only to water clusters. It opens up a completely new field of experimentation.